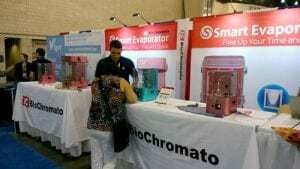 BioChromato exhibited its Smart Evaporator at the American Chemical Society’s National Meeting from March 31 to April 2 in Orlando, Florida. 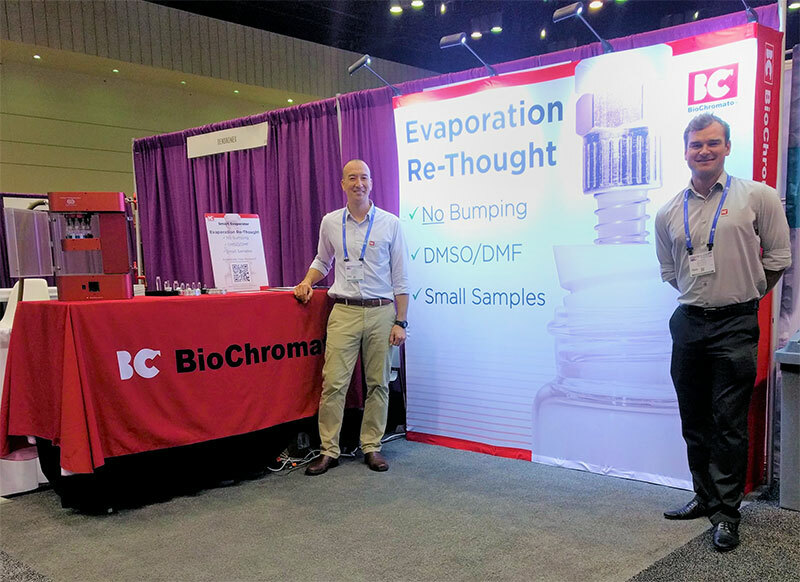 With the theme Evaporation Solutions, the objective was to help researchers solve common evaporation issues, such as bumping, working with DMSO / DMF and concentrating small sample volumes. Attendees had a chance to view the Smart Evaporator and ask questions on its Vacuum Vortex Evaporation technology. Attendees were particularly impressed with BioChromato’s Spiral Plug technology and how it eliminates bumping, while evaporating high evaporation point solvents and allowing even the smallest volume samples to be concentrated easily. Thank you to everyone who stopped by- for those who have any questions, please use our contact form and we will get back to you as soon as possible. Condensing and evaporating samples is a very necessary part of many chemical testing protocols. Samples need to be recovered after screening from their subsequent solvents. Many methods have been created to expedite this process and Biochromato has created an innovative solution to increase throughput and subsequently allow researchers to gather more data faster with the patented Vacuum Vortex Evaporation (VVE) Technology found in the Smart Evaporator. By increasing the overall temperature of the sample and expanding the available liquid surface area by creating a vortex via the patented Spiral Plug design, even high solubility and boiling point solvents can be evaporated in a short amount of time compared to traditional evaporators. Because a complete vacuum is not formed the risk of bumping or boiling of precious samples is entirely avoided. This allows comfort in knowing that the samples will not be lost or ruined due to boil over or spilling, ultimately saving laboratory resources and indispensable processing time. Even tiny sample amounts can be easily evaporated thanks to the wide variety of Spiral Plugs available to incur VVE conditions. Maintain sample integrity, avoid any chance of sample loss and save time while efficiently evaporating with Smart Evaporator’s original VVE technology. How much time and how many samples have been lost already? Learn how to stop losing time and valuable sample resources here. Evaporation is an integral part of chemistry research and the de facto instrument is the Rotary Evaporator, also referred to as Rotovap. As much as they are commonly used for concentrating solvents, they also have a reputation for issues that include bumping and annihilating substances, slow evaporation, especially for DMSO / DMF and other high-boiling point substances and difficulty working with small volumes, all of which can present larger problems for your research. 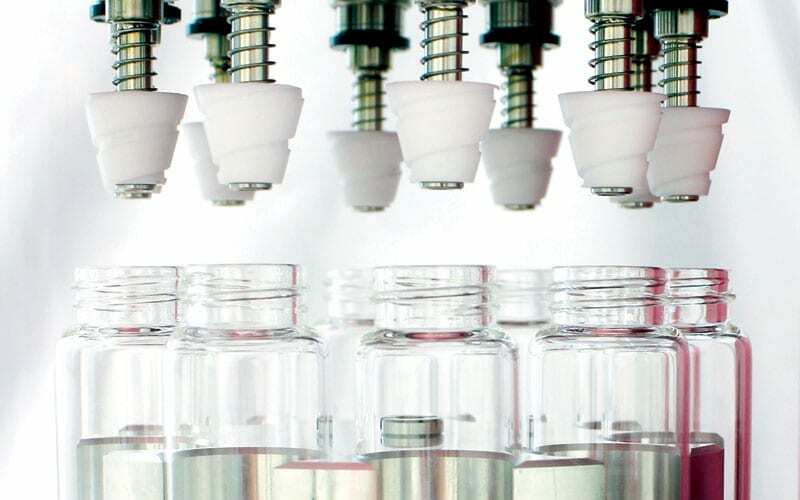 Though Rotary Evaporators do have their use in common applications, as a technology developed over 50 years ago, due to certain design limitations there are certain fundamental issues that cannot be avoided, even when taking the most careful precautions. As a definitive solution to these problems, the Vacuum Vortex Evaporator, also known as the Smart Evaporator was developed to address these common Rotary Evaporation issues. Let’s look at these issues and how vacuum vortex evaporation is designed to address them. Bumping is a common problem while using rotary evaporators, as samples being heated under vacuum in closed conditions causes the solvent to suddenly boil and “bump,” in other words erupt, usually quickly without warning. 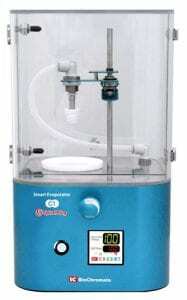 As the rotovap evaporates the solvent under vacuum, the solvent can be sucked up in its entirety, leading to the loss of the sample, not to mention losing time and money. With the Vacuum Vortex Evaporation technology in smart evaporator, the solvent is rapidly stirred in a airflow-based liquid vortex at steady atmospheric pressure, preventing bumping and sample loss. 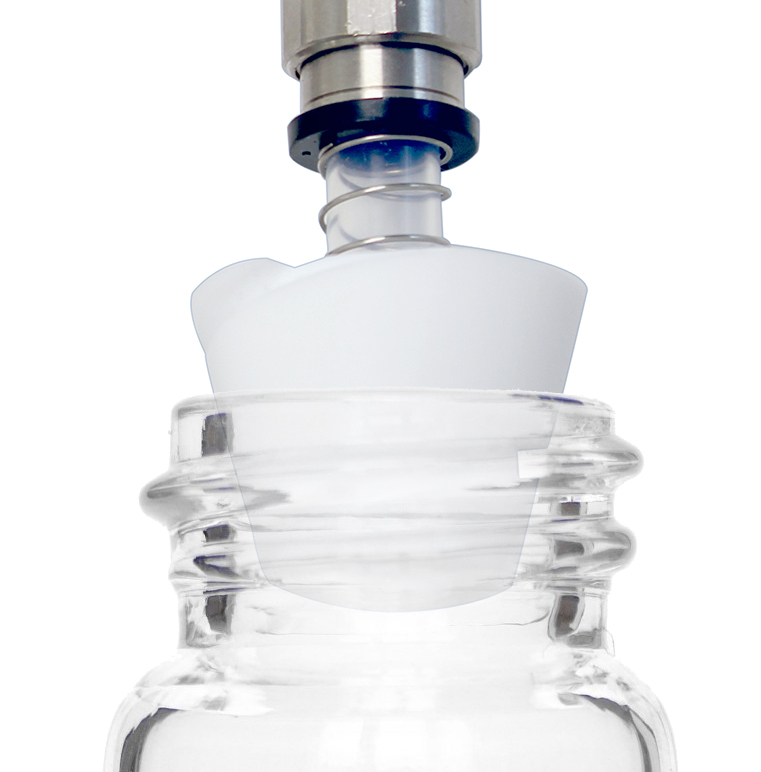 The secret to this bump-proof technology is the patented spiral plug® technology, which allows for air to continuously flow through the sample vial and rapidly evaporate without the risk of bumping. The key to no bumping is in the fundamental design that doesn’t allow bumping conditions to occur in the first place, as opposed to the burden of having to take precautions. Due to their inherent technological limitations, evaporating solvents with Rotary Evaporators can be painfully slow, especially for high boiling point solvents, such as DMF (Dimethylformamide) and DMSO (Dimethyl Sulfoxide). Researchers know that this orthodox evaporation method using a rotovap can take a very long time and is a large bottleneck in the overall synthesis and recovery process. 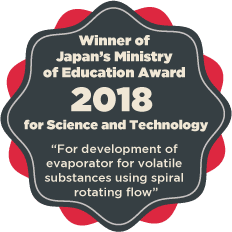 Vacuum Vortex Evaporation takes a novel approach in evaporation by using rapid spiral air flow combined with heat to volatilize and quickly evaporate solvents, even the most difficult high-boiling point solvents such as DMSO and DMF. 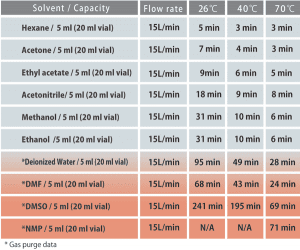 With their high solubility, these very useful solvents can be easily used with the Smart Evaporator in synthesis and sample recovery thereby speeding up your research. Working with rotary evaporators can be difficult, especially with small samples. 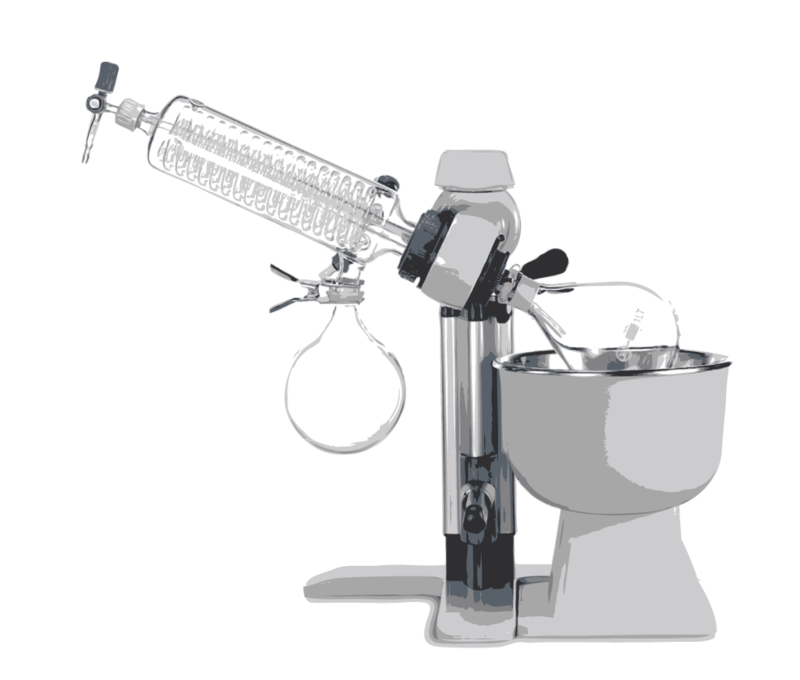 Transferring the solvent to the rotovap, followed by painstakingly scraping the sample from the round-bottom flask, not only leads to wasted effort, lost time and loss of sample, but also presents risk of cross-contamination. The Smart Evaporator works by evaporating samples directly in the vial, a process which not only allows for evaporation of small quantities, but also makes for a quick and seamless process. The sample stays in the vial the whole time, so no need to transfer, monitor, scrape, repeat, etc. 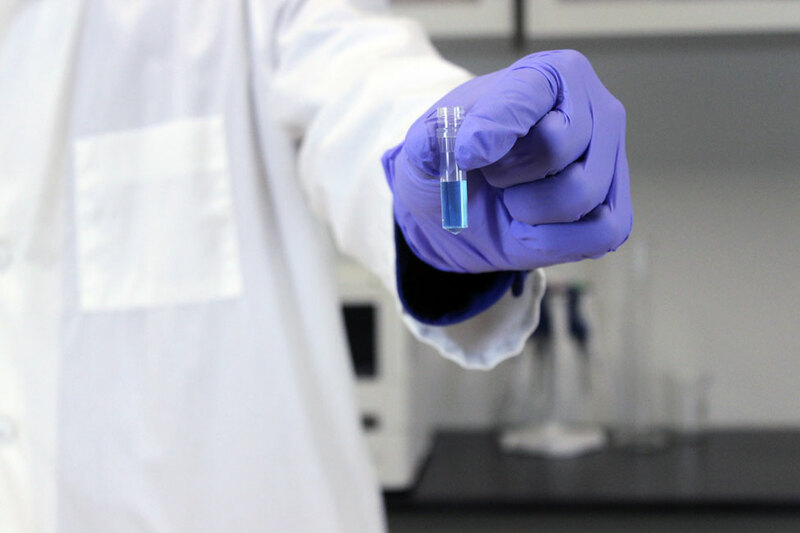 Simply load the sample in the vial and it will be retained in its entirety, resulting in high recovery rates and low contamination risk, without the need to keep a close eye on the entire process. As outlined above, common issues with rotary evaporators such as bumping, slow evaporation times and difficulty with small samples can be eliminated with the Smart Evaporator’s Vacuum Vortex Evaporation technology. The solution-by-design Vacuum Vortex Evaporation technology is the solution for any operation wishing to bypass common rotovap issues, save time and money and accelerate their research to the next level. For more information on Smart Evaporator and Vacuum Vortex Evaporation technology, please visit the Smart Evaporator product page, or contact us with your questions. 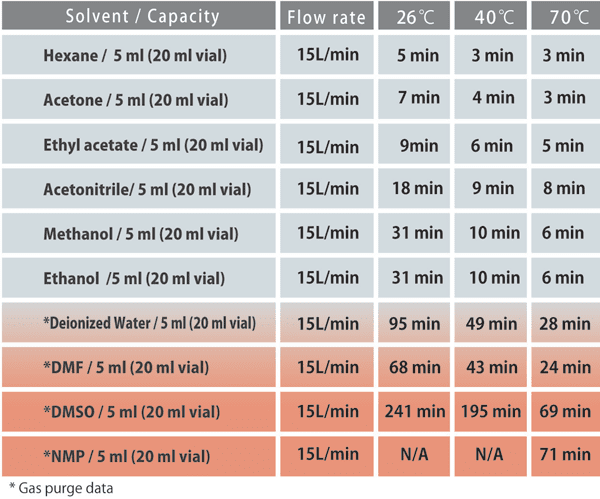 Those who have worked with DMSO (Dimethyl Sulfoxide) and DMF (Dimethylformamide) in organic synthesis and analytical chemistry are likely aware of the difficulty in evaporating and removing these useful, yet stubborn high boiling point solvents. Though using them may be dreaded and have even become a lost cause for others, this article outlines a way to remove these difficult solvents quickly and easily with the invention of new evaporation technology. 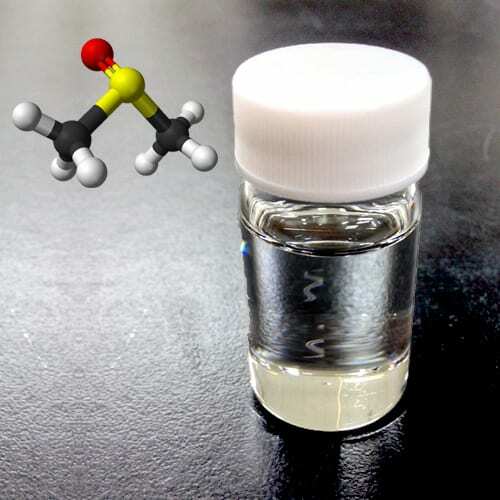 Due to their high solubility and ability to dissolve many compounds that are difficult to dissolve otherwise, DMSO and DMF are commonly used in organic synthesis as a reaction solvent as well as in analytical chemistry for NMR analysis (DMSO-D6, DMF-D7). However, due the the high boiling points of these solvents (189°C for DMSO, 153°C for DMF) those who have worked with them after a synthetic workup or NMR analysis know they are difficult and time-consuming to remove using a traditional rotary evaporator, and have likely experienced problems such as bumping and having difficulty working with small samples. Other methods to remove DMSO and DMF can prove to be time-consuming and inefficient as well. These methods include washing with water and extracting with a lower boiling point organic solvent like DCM1 and freeze drying (lyophilization) after water dilution or solid phase extraction (SPE). However, the large number of transfer steps and multiple washes are not only time-consuming, but are inefficient and result in lower yields and recovery rates. With the goal of solving the problems associated with solvent evaporation, especially DMSO and DMF, the “Vacuum Vortex Evaporator,” also known as the Smart Evaporator, was invented to quickly and easily remove solvents without the common problems associated with traditional evaporation. The key piece of technology in Vacuum Vortex Evaporation is the Spiral Plug, which creates spiral air flow and rapidly stirs solvents under heat and accelerates evaporation, even for high-boiling point solvents such as DMSO and DMF. Using the nitrogen-purging feature, the Smart Evaporator can remove 5 mL of DMSO in just over an hour and DMF in just 24 minutes at 70°C. No Bumping – Because spiral air flow occurs at atmospheric pressure, there is no risk of bumping and losing your sample. Shall We DMSO / DMF? With Vacuum Vortex Evaporation using the Smart Evaporator, DMSO and DMF can be removed quickly and easily, without the hassles associated with standard evaporation methods. If you have any further questions regarding Smart Evaporator and working with DMSO and DMF, please use the contact form below and we will reply shortly. All the best in your research and please let us know if we can help with your DMSO / DMF needs! Removal of solvents is a common need in any organic chemistry lab and often times the major “bottleneck” in a synthetic workup, thereby slowing down production. Additionally, evaporation of solvent is required for recovery of samples analyzed by NMR spectroscopy. To accomplish this task, different types of evaporators have been developed. Herein, we provide an overview of solvent evaporators commercially available on the market. 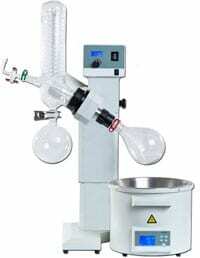 A rotary evaporator (rotovap) works by placing the sample under vacuum thereby lowering the boiling point of the solvent. Typically, a round bottom flask is used where it is lowered in a heated water bath. The flask is rotated to increase the surface area and provide an even transfer of heat. A rotovap is found in almost any organic chemistry lab and is a great way to quickly evaporate most volatile organic solvents. 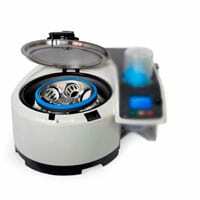 Thus, it is typically used when evaporating single volatile samples at relatively larger sample volumes. However, since the glassware is under high vacuum, there’s always a risk of the solvent superheating and boiling over or “bumping.” Once a sample boils over, there is a high risk of cross-contamination and losing material. There’s also a safety concern regarding the glassware as improper selection or defective glass could lead to an implosion. Additionally, since it can only handle a single vessel, evaporating multiple samples must be done in series, which can be time consuming. A centrifugal evaporator also works under high vacuum to lower the boiling point. However, instead of rotating the glassware, samples are placed in a multiplexed heated compartment where they are centrifuged to avoid bumping. A centrifugal evaporator is a great way to evaporate a large number of samples at once since they can accommodate multiple centrifuge tubes at a time. However, it may not be suitable for higher boiling point solvents like DMSO or water, as it can be time-consuming, typically overnight. This is particularly frustrating If you only have a few samples to evaporate, and tying up your evaporator for many hours creates a backlog of your other samples you wish to dry down. Additionally, care must be taken by the operator to ensure that the samples are well balanced and proper centrifuge tubes are used as improper glassware tends to break under centrifugal force. This can be quite problematic when working with precious samples or hazardous material. Nitrogen evaporators use a stream of nitrogen gas to continuously blow on the surface of a solvent (AKA “Nitrogen Blowdown”). This lowers the vapor pressure and increases the surface area. To accomplish this, some chemists simply connect a nitrogen gas line to a syringe to dry down a single vial. However, this is easier said than done. If the flow of nitrogen is too far away from the sample surface, the evaporation speed may be too slow. If it is placed too close, there is a risk of samples blowing over. Indeed, care must be taken for optimal results. In order to better optimize and automate the process, companies have developed nitrogen evaporators. Typically, the nitrogen gas is heated and/or a heat block is used to speed up evaporation. Since a nitrogen blowdown system can be connected to an array, nitrogen blowdown is useful when working with high number of smaller sample sizes (ex. 96 well plates). However, nitrogen blowdown is not recommended for large sample sizes, especially working with volatile or semi-volatile samples due to both time and turbulence. A novel evaporation system offers a new means for evaporating samples in vials using a spiral air flow evaporation method. This method has been developed by BioChromato in an instrument commercially available called the Smart Evaporator. Unique Spiral Plugs are placed over the vial where it is connected to a vacuum pump. However, instead of pulling a high vacuum, as the vacuum pump aspirates the vapor above the solvent surface, the helical grooves of the Spiral Plugs draw in an influx of air or inert gas. The Spiral Plugs control the airflow over the surface of the solvent in a spiral. This both lowers the vapor pressure and increases the surface area. Meanwhile, sample vials are placed in an aluminum bead bath connected to a programmable heater up to 100°C where heat is transferred to speed up the evaporation process. There are many benefits using the Smart Evaporator. Since it is flow-based, there is no risk of bumping or splashing. Additionally, since concentration is carried out just below atmospheric pressure, there is no risk of implosion. Thus, any vial, flask, or tube that fit in the instrument are compatible, allowing direct concentration in a sample vial already being used. This can help avoid cross-contamination and result in higher yields. This is a useful method in evaporating higher boiling point solvents like DMSO, DMF, or water. 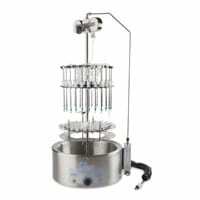 A Smart Evaporator is an excellent way to evaporate high boiling point solvents directly in a sample vial. With the multiple channel models, it’s possible to evaporate up to 10 at a time. We introduce a simple way to remove Dimethyl Sulfoxide (DMSO). 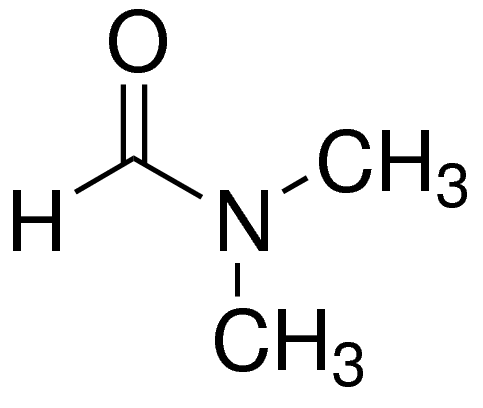 DMSO is used in organic synthesis as a reaction solvent as well as analytical chemistry for NMR analysis (DMSO-D6) due to its ability to dissolve many compounds that are difficult to dissolve otherwise. However, after a synthetic workup or NMR analysis, DMSO is difficult to remove using a traditional rotary evaporator due the the high boiling point (189°C). 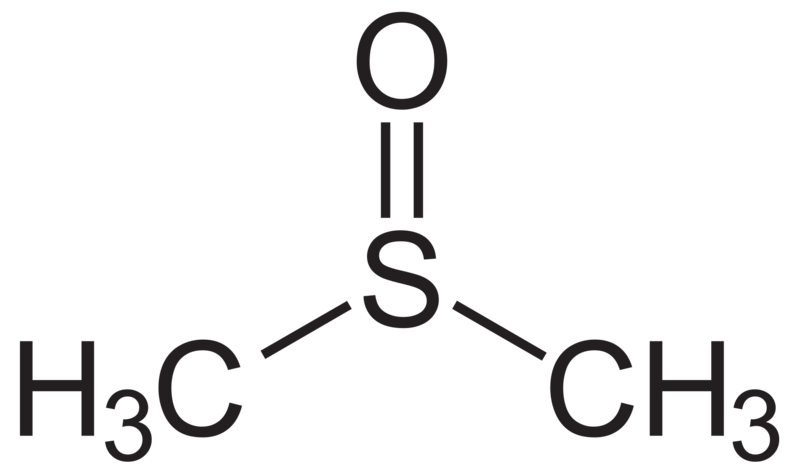 To remove DMSO, a common method is to wash with water and extract with a lower boiling point organic solvent like DCM1. Other methods involve freeze drying (lyophilization) after water dilution or solid phase extraction (SPE). However, these methods involve several transfer steps, are very time consuming with multiple washes, and can be inefficient resulting in lower yields. An easier way has been developed to evaporate high boiling point solvents like DMSO directly in your sample vial using the Smart Evaporator. The Smart Evaporator uses a novel concentration principle of solvent removal by spiral air flow with its unique Spiral Plug design. Since there is no sample transfer required, sample loss and risks of cross-contamination are minimized. With its nitrogen purging feature, the Smart Evaporator can remove 5mL of DMSO in just over an hour at 70°C. In addition, since it is never under high vacuum, there is no risk of bumping, for hands-free concentration. After we received the 42nd Invention Award in 2016, the Japan Society for the Advancement of Inventions recommended we apply for this award. They give this award to the people who develop superior technology. And who contribute to the development of the regional economy in small and medium enterprises and local industries. We could have not achieved this without your support, and we are thankful for it. (head) Kazumasa Kinoshita, Representative Director of BioChromato, Inc.
Mutsuo Nakajima Former Senior Researcher of Sankyo Co., Ltd.
We will continue to devote ourselves to develop products based on customer’s voices. We kindly ask for your continued cooperation. The detailed information is available here* on the website of Ministry of Education. *We apologize as it is available in Japanese only. 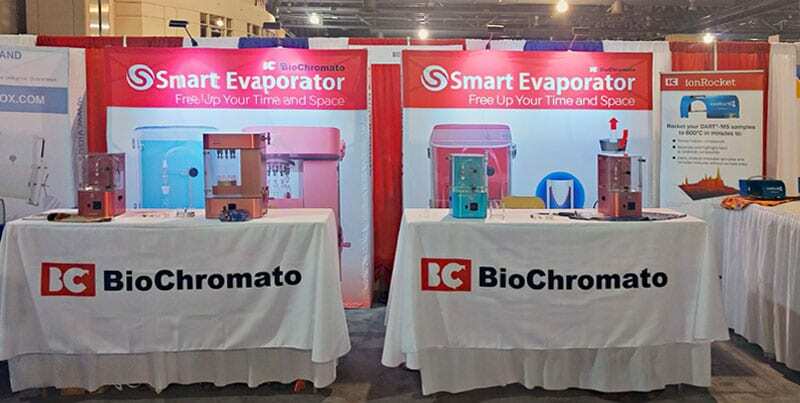 BioChromato exhibited at ACS 2016 in Philadelphia this past August 21-25. 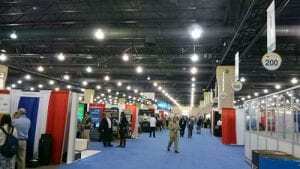 We had a great show with a steady traffic of Chemists. Our lab consumables (EPS and Slit Seal) were on display. As well as our newest Mass spectrometry products, the ionRocket and Volatimeship. However, the star of the show was our Smart Evaporator (C1 and C10). We had many interesting and great conversations with many chemists from both industry and academia. We talked about the work they are doing and we discussed how our products may ease their work. We learned a lot from them. Several of the chemists we spoke to are working in radiochemistry working with hazardous radioactive substances. The small size of the C1 impressed them as well as the ability to work inside a hot cell. We also spoke to other chemists in medicinal chemistry working with small vials. They want to concentrate directly in their own sample vials. The C1 Smart Evaporator would be a great benefit for these researchers because the C1 allows direct concentrating in vials. For synthetic organic chemists, being able to evaporate bump free is a major benefit. We heard a story about a 6 step synthesis process that resulted in a complete loss due to bumping caused by a Rotary Evaporator. A whole month’s work gone to waste. We were also visited by many colleagues of happy customers that referred them to us. We continue to impress with its ability to evaporate bump free. Thereby reducing the risk of losing their material. 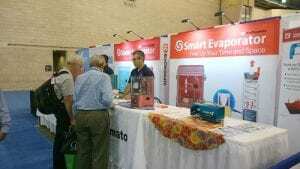 We had the Smart Evaporator C10 on display. People were able to see the multi-channel system. Their major takeaway: cross-contamination free between samples due to the vacuum technology. There is also great interest in the C10 from teaching labs. Often, students are working on the same synthesis step and they have to fight over the only functioning Rotary Evaporator. Evaporating 10 samples at a time will reduce this bottleneck. Thanks to everyone that stopped by. For those that were not able, we look forward to a conversation. Please feel free to contact us to learn more about how we can help streamline your research process.